First off, I would like to extend a big thank you for the support of my fellow community for engaging, providing feedback and encouraging me along with my blog and website. I have had a few people interested in the name Original Silence, my logo and how I came up with these. So I thought I would explain the reasoning and ideas behind these concepts. Why the name Original Silence? Approximately 2,500 years ago, there was a great Sage called Patanjali. He wrote one of the most important foundational texts of Yoga. This formed the basis of Yoga as we more commonly know it today. His book is written as a series of short verses, 196 to be exact. Here he describes practical ways in which yoga can be used to purify the body, the mind and draw the attention within. The eventual aim was to achieve a state of bliss, enlightenment or liberation. Contrary to the common misconception of yoga, he explains that Yoga is made up of 8 different aspects or ‘Limbs’. Most people know yoga as the physical practice of ‘Asana’ which is only the third limb of yoga (the other seven limbs deserve a blog post of their own so I will leave that for another day!). The 8th or final limb of yoga is described as “Samadhi” and is a state where the body and external senses are purified and at rest. However, the mind is alert and has reached a higher state of consciousness. This was the yogi’s ultimate goal, where the true purpose of life and a place where true reality is unveiled. I imagine this as a place of original silence, all the fluctuations of the mind are still, where the past and the future are at peace, the place where the mind was originally, before life happened, before thoughts and opinions coloured the mind. Before thoughts even existed. When I think of this place, it brings an overwhelming sense of calm and peace - somewhere I can return to at any time. Some people I have spoken to have completely different interpretations when thinking about this and I’ve loved hearing what comes up for different people. And why the triangles on the logo? Speak to any yogi and you will get something along the lines of “Everything is connected through vibration, the physical body is made up of different vibrating energies pulsating at a particular frequency”. Without getting too scientific and to keep this brief, Cymatics is the study of sound waves and frequency. Experiments have shown that when particles are placed on a flat metal surface (or tonoscope) and vibrated with sound frequencies, the particles move to form intricate geometric patterns. You can watch a mesmerising YouTube video here and another here. 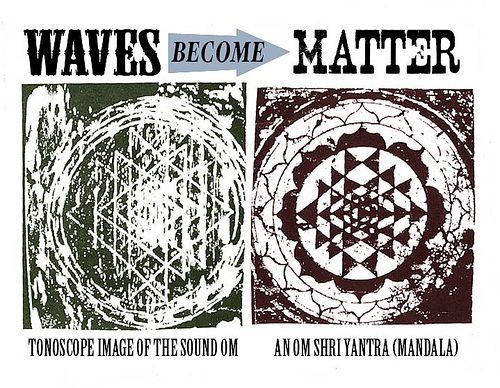 Yogi’s believe the original sound of the universe is Om or Aum. Traditionally, it is chanted at the beginning and end of every yoga class (I too include it in my classes), and also used in chanting and meditation. It is believed (controversially), the frequency of Om produces a visual pattern of triangles, as you can see in the picture to the right. The caveat being, this image does need more evidence and research, but alas, it was the inspiration for my logo. Coming from a design background, I had a few different versions of the triangles (whilst trying desperately to avoid a radioactive-resembling symbol!) and settled on a super simple design. I thought this clean, pure and minimalist logo wrapped up my thoughts on the name Original Silence perfectly and hence the logo was created.